There are hundreds of good reasons to move to the East Bay -- specifically, the amount of dollars you're saving by not renting a 400sqft closet for $1500 a month. But that rent break definitely overshadows some of the area's other pros, like proximity to these 14 incredible hikes. They lead to insane views, ancient seabeds, secret labyrinths, volcanoes (?! ), and maybe a moving van company. The last one's your call. If you’re new to the majesty of the East Bay Regional Park District, consider this your gateway drug. Paved, well-marked, and with immediate vista payoffs around every turn, Nimitz Way is a multi-generational crowd pleaser. On weekends the trail is jammed with joggers, strollers, dogs, and families, so if you’re seeking peace, go mid-week. Nearing the two mile mark, take Wildcat Peak trail to reach the Rotary Peace Grove Lookout where you can take in views spanning the world (well, the best part of it). Take the paved West Shore trail (3.64 miles r/t) from the Marina to the dam. If you have binoculars, stop at Alder Point to spy the bald eagle (‘Murica!) nest across the lake. Otherwise, walk to the dam where you can often see the pair flying across the lake. For a more strenuous hike, though, continue on from the dam to circle the lake via the West Shore Trail, to Bass Cove Trail, to Columbine Trail, to Honker Bay Trail, to Cameron Loop Trail, to East Shore Trail back to the Marina. The paths aren’t always clearly marked, so be alert. The lake is currently experiencing a toxic algae bloom that is deadly to dogs and bad news for people. Best to leave dogs at home and watch kiddos or frisky grandparents who might dive in if unattended. And those gunshots you hear? Don’t be too alarmed -- there’s a gun range nearby. 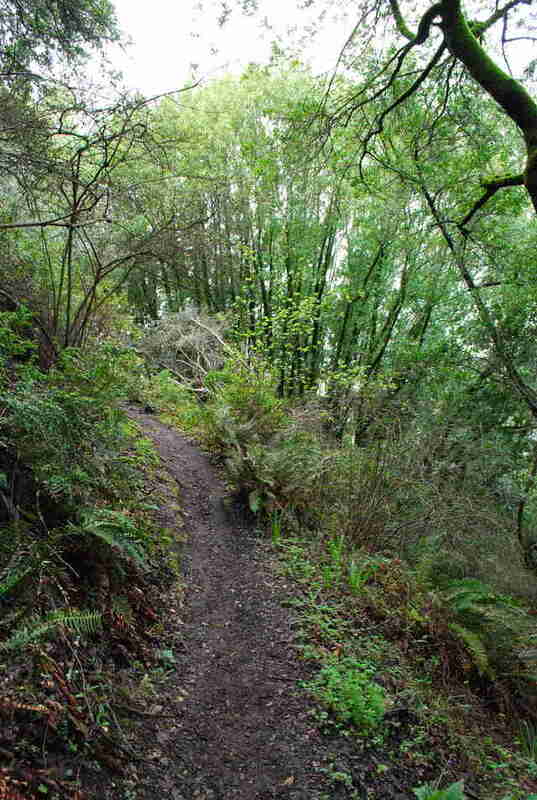 This is a sweet loop circling the prize jewel that is the Redwood Regional Park. Start at Canyon Meadow Staging area and take the Canyon Trail for a short hop up to the East Ridge Trail. Cruise the east side where the unsheltered ridge provides sweeping views. Keep an eye out for fast-moving mountain bikers. Breezing through the Skyline Gate Staging Area is your approximate halfway marker, where you’ll link on to the West Ridge Trail (where you have wide-open views towards Contra Costa) to complete the circuit. Take Shady Glen Trail out of the visitor center lot, cross the small bridge over Alameda Creek (Alameda County’s largest stream), and link up to Flag Hill Trail. You’ll quickly climb out of the woods as you gain elevation. At the top, you’ll enjoy fabulous views across the valley, reservoir, and watershed. Look out for sandstone formations with fossils of life from ancient seabeds and maybe even spot a bobcat or two. To impress a date, follow up the outdoor frolic with an afternoon of wine tasting at Elliston Vineyards, then take a romantic ride on the Niles Canyon Railway. Serious mojo. Reason No. 5,487 we love California: redwood trees in our backyard. From Skyline Gate, walk the exposed East Ridge Trail until you hook right down into the park’s valley on Prince Trail. The temperatures dip coming off the ridge, and you’ll notice the immediate change in vegetation. Descending Prince Trail, hook left on Stream Trail. (From November to February, be on the lookout for wintering ladybugs who take up camp in clusters by the millions right near this trail intersection… whoa.) Take a minute to appreciate the calm and quiet among the massive redwoods. Follow Stream Trail until taking a right on Fern Trail. Get your heart rate up as you climb out of the valley on Fern Trail. When you hit West Ridge, take a right, and follow it all the way back to Skyline Gate, enjoying/Insta-ing the gorgeous views along the way. Waterfalls in the East Bay? You’re damn right. Head to Mt. Diablo State Park to take in nature’s bounty, y’all. The hike is pretty hard, and the going can be slippery if it rained recently (hahahaha yeah right), but there’s a series of lovely waterfalls throughout all the hard work (especially if you’re there during the springtime; you may be out of luck during high-drought season). The trail loop isn’t terribly complicated, but the trail names switch up a bit. You’ll be less likely to get lost and have to live under a waterfall forever if you just follow this trail map. 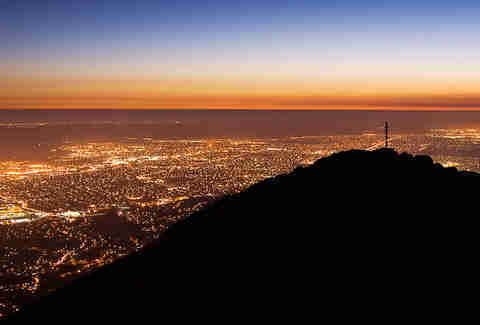 If beautiful, flowing water has never been your thing -- skip the falls and take in the Mount Diablo Summit. There are two ways to do this: 1) hike the North Peak like a badass and enjoy your hard-earned views, or 2) drive up to the summit and have your cake and eat it too. Either way, on clear days the park states you have visibility over 40,000 square miles and can spy segments of 35 of California’s 58 counties. So. That’s pretty great. Labyrinths, volcanoes, vistas, oh my! Not only is Sibley fun for bird-watching (hurray for the cool kids! ), it’s of keen interest to geologists and science stars. 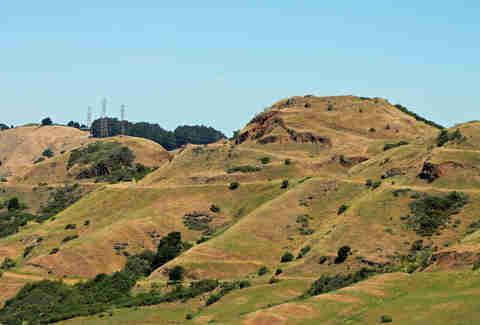 Round Top peak is comprised of 10-million-year-old volcanic stuff and is the result of tectonic action between the Hayward and Moraga faults. Snag a brochure at the visitor center for the self-guided volcanoes tour with all the real geological dirt. At stop No. 4, you’ll see a labyrinth at the base of the quarry that adds a mystical touch. Get a dose of ancient history, and enjoy a beautiful hike with views of the rolling hills that surround you. 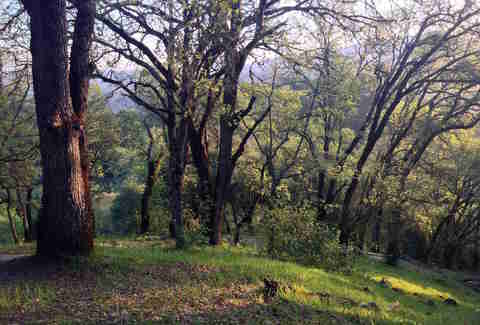 Start out in the tranquil lawn area in the park’s only entrance off San Pablo Dam Rd. Hop onto the Laurel Loop Trail behind the park office. Follow Laurel Loop -- leaving behind the massive eucalyptus trees in the picnic area -- until you reach Lower Seafoam Trail. 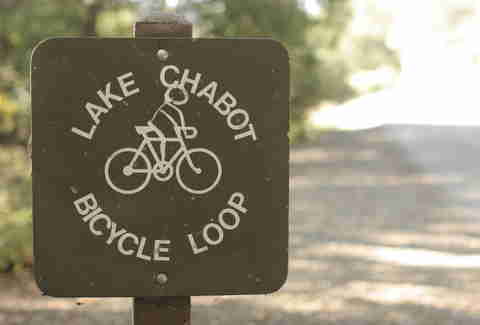 Curve right on the path and enjoy the beautiful views of the San Pablo Reservoir as the trail opens. Continue on and merge onto Upper Seafoam Trail where the elevation picks up -- as will your heart rate. Keep truckin’ on up to the twisted and beautiful trees in the oak grove at the peak of the trail. Maybe whip out your camp chair and have a mini-picnic in this lovely spot. When Upper Seafoam hits Kennedy Creek Trail, hook left and bring it on home. Besides having arguably the coolest name of the parks (Mt. 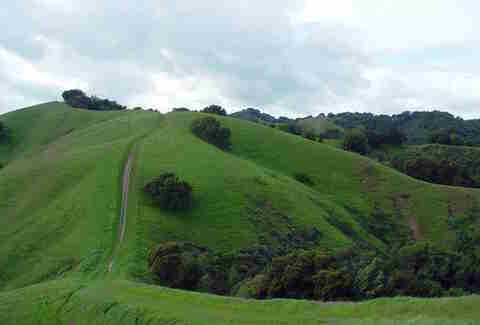 Diablo is a serious contender too), Wildcat Canyon is the perfect place for hikers who live in El Sobrante and El Cerrito. Abutting Tilden’s northern-ish edge, Nimitz Way continues into this park. To take the featured loop, enter at Alvarado Area and head out on (the also paved) Wildcat Creek Trail. Hopefully the creek will be full of water as you parallel it until reaching Mezue Trail where you turn left to begin your ascent. This portion is steep at times, but your hard work is rewarded as views of Mount Tam, San Francisco, and the entire East Bay open up. Turn left when you reach San Pablo Ridge Trail, appreciating the views of Mt. Diablo and San Pablo Reservoir. The descent can be steep, but the views sure are purdy. Merge left onto Belgum Trail, which will bring you back to Wildcat Creek Trail to complete the loop. Nice job. Briones is the right-in-your-backyard spot you’ve been missing out on. 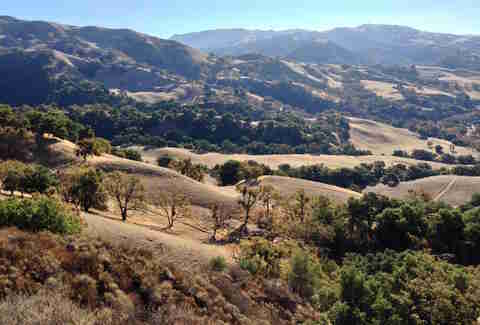 For spectacular views and a solid workout, take the eight-mile Briones Crest Trail. Head out of Bear Creek Staging Area, up and around the park on Briones Crest Trail (all the while enjoying breathtaking vistas), then back down until reaching Seaborg Trail just past mile six. Seaborg Trail will bring you back from whence you came. Briones is full of accessible hiking trails with a variety of options for shorter loops, so choose your own adventure if you’re just after a quickie. And be sure to make another visit in spring, when all the wildflowers are popping. 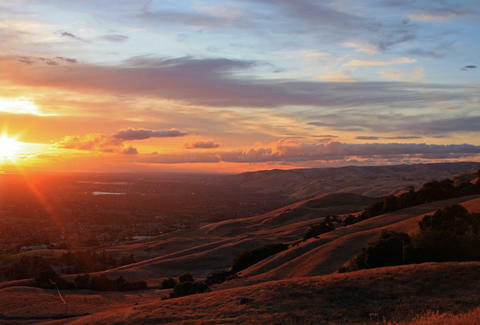 Due to the popularity of this hike, Mission Peak Regional Preserve requests hikers park at Ohlone to relieve overburdened staging areas in residential ‘hoods, and you'll understand why there's such popularity for it when you get there -- you’re on top of the world. 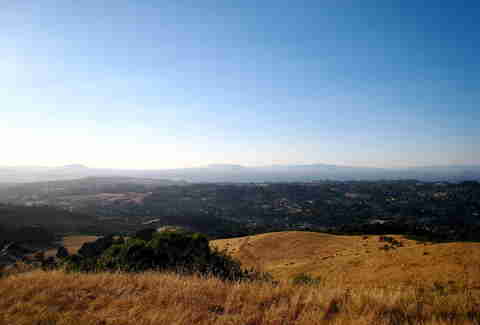 View the Santa Cruz Mountains to the west, Mt. Tam to the north, and the Sierra Nevadas and Mt. Diablo to the northeast. Winter is a great time to go for glimpses of snow-capped mountains. Spring also yields mad wildflowers. You’ll gain about 2,000ft in elevation. Bring snacks and water fo sho. The park is named after the Spanish word for the traps that were once used to catch elk here. Sadly, it is not a wilderness full of free roaming tramps. These hikes are steep! Eat a good breakfast before embarking. Head out on Chamise Trail, then merge left onto Las Trampas Ridge Trail, hook right on Corduroy Hills Trail, right on Madrone Trail, to Sulphur Springs Trail, to Trapline Trail. Winter and spring are perfect seasons to hike here. Huckleberry is special. 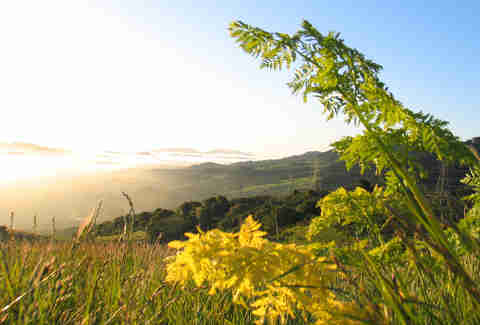 Due to unique soil and climatic conditions, the native plants here can’t be found anywhere else in the East Bay. Even better? Huckleberry has blossoming plants year-round. If you want to put sparkle in your date’s eyes, bust out the big guns with this sweet stroll. At the information area, the self-guided tour teaches all about the plant life. Two mini trails cut off the upper path for clear views out towards Mt. Diablo. Trailhead: It's poorly marked, but find the parking lot behind Foothill (you'll enter through Cyclotron Rd) and go to the very end of the lot and make a U-turn at the only uphill path. This is actually a mildly strenuous hike, but the payoff is 1) you get to see THE ENTIRE BAY AREA, literally, North Bay, SF, all of the East Bay (the view is straight out of control), and 2) you'll get to see UC Berkeley's Big C up close and personal, which the charter for the school is buried underneath. Also a cool side stop on the way: there's a trail split mid-way up and if you go right it'll take you out to Tightwad Hill where students/alums w/o game tickets get a not-actually-that-bad view of Cal football in action right next to the victory cannon. Oh, and there's a swing! Annie Crawford is a freelance writer living in Oakland, CA. Follow her @ReinaAnnie.